The partition of the Indian subcontinent in the post Independence period of India has pushed Northeast India into a landlocked area, inconveniently connected by road and conveniently by Helicopter service. Even the Department of Tourism, Government of India has planned Nepal-India-Bhutan Buddhist Tourism Circuit using the Helicopter Service, calling it the Heli-tourism project. Helicopter service runs presently in several places of Northeast, so far so that because of the demand there locally, tourists hardly have any access to the same. Though this is the only fast service, the same is not reliable enough. The Meghalaya and Tawang accidents taking several lives should have been an eye-opener for all of us and we should have worked on a better and safer operating system. Today the missing of Shri.Dorjee Khandu since the past 03 days has put the whole travel industry of Northeast India in great grief. Shri.Dorjee Khandu, the Chief Minister of the Indian state of Arunachal Pradesh is a strong believer of tourism as a tool for development and to implement all his programs at the grass-root levels, he has started with the mission 'People First'.Only the other day I was discussing with the Gaon Burha (Village Head) at Pakke Tiger Reserve that we must request the Hon'ble Chief Minister to inaugurate the 'Pakke Jungle Camp' and we were jointly planning to meet him in this regard by the middle of this month. I still remember the date when I had gone to meet him for the first time with Mr.Chowna Mein, when he had just taken over as Chief Minister. I was impressed at his priorities with conservation of nature and attaching people's livelihood with it. 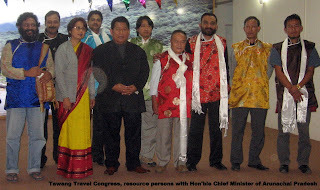 Again meeting him at our Pangsau Pass Winter Festival and the Tawang Travel Congress was quite encouraging, specially at the Tawang Travel Congress, when both he and his wife personally looked after all of us, the resource persons, as an host at home. The whole travel industry of Northeast India is praying to the almighty for the immediate return of one of India's most popular and committed Chief Ministers. Thanks a lot for giving proper tourist knowledge and share different type of culture related to different places.